Heavy cavalry are so called to distinguish them from the light cavalry forces. It is not the job of heavy cavalry to pursue enemies. It is their lot to use their speed and weight directly against enemies, battering them into breaking by shock of impact. To this end, they are usually armed with fearsome heavy swords that are quite capable of skewering a man or carving him in two. This role often means that heavy cavalry are held as a reserve by a wise general, so that they can be used to batter a hole in a critically weakened part of an enemy line. 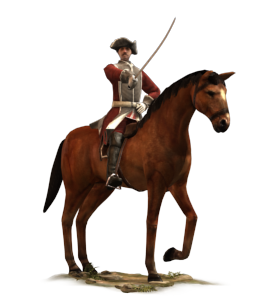 Historically, there was debate during the period about the purpose of cavalry forces. Some generals favoured having their men close with the enemy and use “cold steel” for its terrifying morale impact. Britain’s John Churchill favoured this approach, keeping his men short of ammunition while on campaign so that they weren’t tempted to use any bullets in battle! The other school of thought, naturally enough, favoured using cavalry firepower to break enemy formations. Heavy cavalry did, therefore carry carbines and pistols, depending on the army they served in.